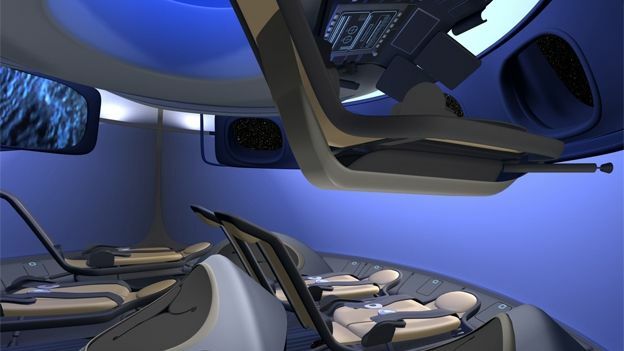 Boeing has taken the wraps off its new spaceship interior and it looks an awful lot like something out of Star Trek. The cabin of the CST-100 spacecraft is the first from Boeing that has been designed for paying passengers, not NASA astronauts. The sleek interior places considerable emphasis on comfort and space, both words you would hardly associate with the current crop of spaceships. Boeing has used large windows to help give passengers and the pilot a much wider field of view whilst also showing off the incredible views that would inevitably then follow. To help move the idea of space travel into the realms of reality Boeing's also transferred a lot of design cues over from its new range of airliners using the company's trademark blue lighting scheme. Obviously there's no in-flight entertainment because, well, you'll be in actual space but the seat configuration does allow for hand luggage and up to 10 passengers for short journeys. With Bigelow looking to launch the first privately owned space station by 2016 Boeing actually plans to have the CST-100 flying passengers by the time the space station is ready.